This is a story about the mind. Beyond the latest findings from brain and behavior research, it is about your mind and how you can use it better-a skill we need more urgently today than ever. If you are inclined to "judge" this book by its cover, or are wondering why it has no testimonials to help you decide, you need to read Enduring Edge. This book will not just make you think-it will challenge the very foundations of how you think. It reveals why our "gut" reactions and the words of others are not always our best guide and how we can each be an expert on our own mind. 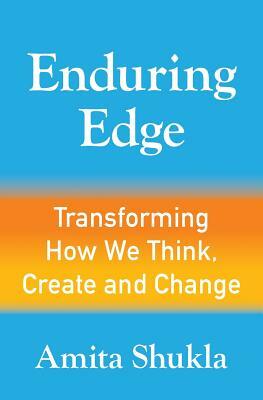 Grounded in diligent research and infused with practical insights, Enduring Edge takes us on a timeless journey-to the very edge of who we are-to reveal who we can become. We learn to face our fears, discover our purpose and passion, and unleash our creative potential. Along the way, we attain the power to transform-our mind, our health, our work, our life, and ultimately, our world. About the Author: Amita Shukla is an innovator and entrepreneur with over a decade of experience in investing in healthcare innovation. She regularly mentors, teaches, and speaks to entrepreneurs and leaders. She has a BA in biochemistry from Harvard, where she was a Senior Editor at the Harvard Crimson, and an MBA from Stanford. She holds 10 patents. Drawing on her wide-ranging experiences, Amita brings to her work-and her words-an immigrant's sense of adventure, an inventor's love of creating, an entrepreneur's passion, a venture capitalist's balanced optimism, and a yogi's sense of serenity.